The French are actually not big dessert eaters, which is surprising since they offer an incredible repertoire of famous French desserts. 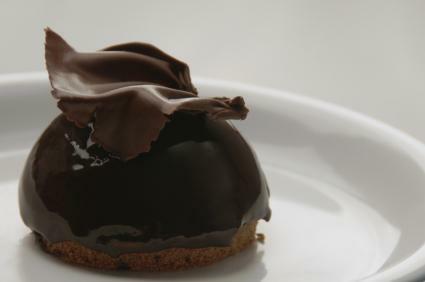 However, you will almost always find that French desserts are elegant and require a fair amount of expertise to create. Perhaps this is why many of their pastries and decadent desserts have become imitated throughout the world. Light and fluffy: Many french desserts, such as meringue and mousse are whipped to the point that they incorporate a fair amount of air. Layered: Cakes such as dacquoise and mille feuilles have several layers that all must be prepared separately. Flaky: French pastry, which perhaps is what you think of when you think of French sweets, typically uses a lot of butter which makes the pastry very flaky. Rich and creamy: While the French are not the first to work with custards, they have definitely taken them to new heights. Crème brûlée, which literally means burnt cream, along with the distinctive choux à la crème (as well as a few others), are simply divine. Long and complicated: Compared to American cuisine, most French desserts will take you several hours to complete and are made in a series of stages. Attention to detail: Actually, attention to detail is something that could describe French cuisine in general, but certainly desserts are no exception. Everything is important -- from the main component of the dessert to the fine garnish and presentation. Interestingly, French mousses and custards got their starts as savory dishes rather than sweet dishes. In fact, it is thought that the first puddings looked much more like sausages as they were boiled in special "pudding casings." Mousses today looking nothing like sausages, however, you will find the occasional savory mousse in France. Technically, mousse is a type of cream made from egg yolks, egg whites, and sugar. Chocolate or other flavorings can be added and then of course the dish is whipped in such a way as to incorporate a substantial amount of air to make the dessert light and fluffy. Dacquoise is a cake that is made of layers of nut flavored meringue and buttercream. Literally meaning 'burnt cream', crème brûlée is a plain vanilla custard (it sometimes can be infused with other flavors but that is not typical of the French version), that is topped with sugar. The sugar is then carmelized by a kitchen blow torch or some other heat source. Crème brûlée, like most custard, is served cold in individual ramekins. Mille-feuille, which literally means a thousand sheets, is made up of layers of French puff pastry and filling. The filling is usually vanilla cream, although mille-feuilles (also written as mille feuilles and millefeuille) can also come in savory flavors with spinach and cheese fillings. The top is garnished with a fondant. This pound cake is flavored with a distinctive butter and lemon taste. You can always recognize madeleines, or petites madeleines as they're sometimes called, by their distinctive shell-like shape. Despite it's nationally known status, the tarte tatin was created by accident at the Hôtel Tatin. The story goes that one of the owners was trying to bake an apple pie and left the apples carmelizing in the sugar mixture too long. When things started to burn, she quickly stuck the carmelized apples on the bottom and threw some pastry on top and thus was born an instant hit. To this day, the tarte tatin remains the signature dessert for the Hotel Tatin located in Lamotte-Beuvron, France. Believe it or not, making French pastry or meringue is not as hard as it looks. Crème Brûlée is one example of a dish that seems complicated that is not. This recipe makes 2 5-ounce ramekins. Cut the vanilla bean in half lengthwise. Place the cream, scraped vanilla bean (pod and seeds), and the half the sugar into a saucepan. Place over a medium flame and heat just to the point of simmering. While the cream is scalding, whisk the egg yolks and remaining sugar together until thick. Remove the cream from the heat. Pour a very small amount into the yolks while whisking. Pour the tempered yolks into the cream while whisking. Strain the custard into a bowl or large, heatproof measuring cup. Pour the custard into the ramekins. Place the ramekins into a roasting pan and place the pan in the oven. Pour water into the roasting pan to halfway up the side of the ramekin. Bake for 20-25 minutes until the custard is just set. Let rest in your refrigerator overnight. Before serving, sprinkle the top with sugar. Burn the sugar with a torch. Chocolate Mousse: Find out just how easy it is to make your own chocolate mousse. Choux Pastry: Master the art of making homemade cream puffs. Easy French Dessert Recipes: Find out how to make other surprisingly simple sweets, including Chocolate Madeleines, Napoleons and more.